LOCATION! LOCATION! LOCATION! MOUNTAIN AND GOLF COURSE VIEWS TO DIE FOR! This beautiful custom built Celebrity home is located on the 14th hole of Hyland Greens Golf Course! You will enjoy absolutely incredible views from every level! Gracious entry with circular staircase! Huge, beautiful kitchen w/ slab granite counters, abundant cabinetry, stainless steel appliances & large walk in pantry. Custom ceiling treatments throughout! Butler's pantry w/ wine refrig! Hardwood flooring throughout all main living areas including all bedrooms! 2 full master suites (main and upper level) both complete w/ fireplaces, custom ceiling treatments, walk-in closets & built-in closet systems. Upper level master has coffee bar, refrig. & private deck! 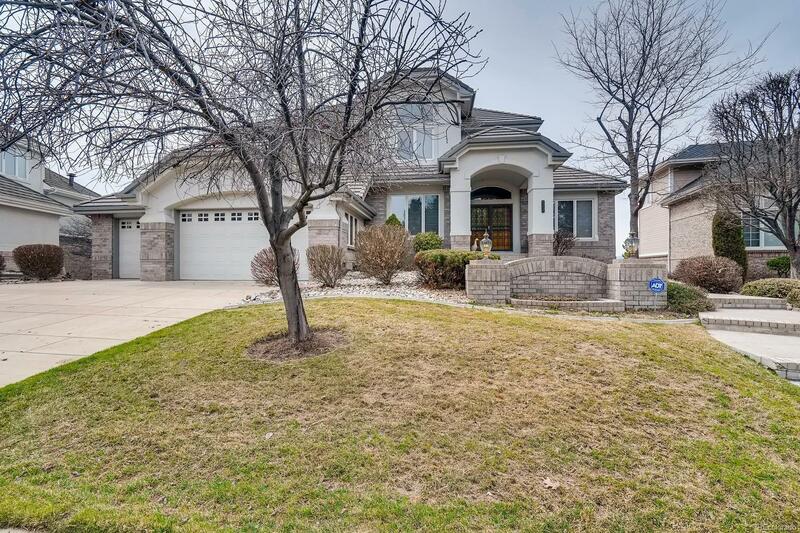 2,880 square foot partially finished walkout basement with incredible storage areas! Enjoy gorgeous sunsets from main level expansive deck! This is what Colorado living is all about!